February 06, 2018, 5:48 p.m.
Today marks the centenary of the Representation of the People Act 1918, which granted women the vote for the first time. Given the gender and pay equality issues that have once again risen in the news agenda, this anniversary is timely. 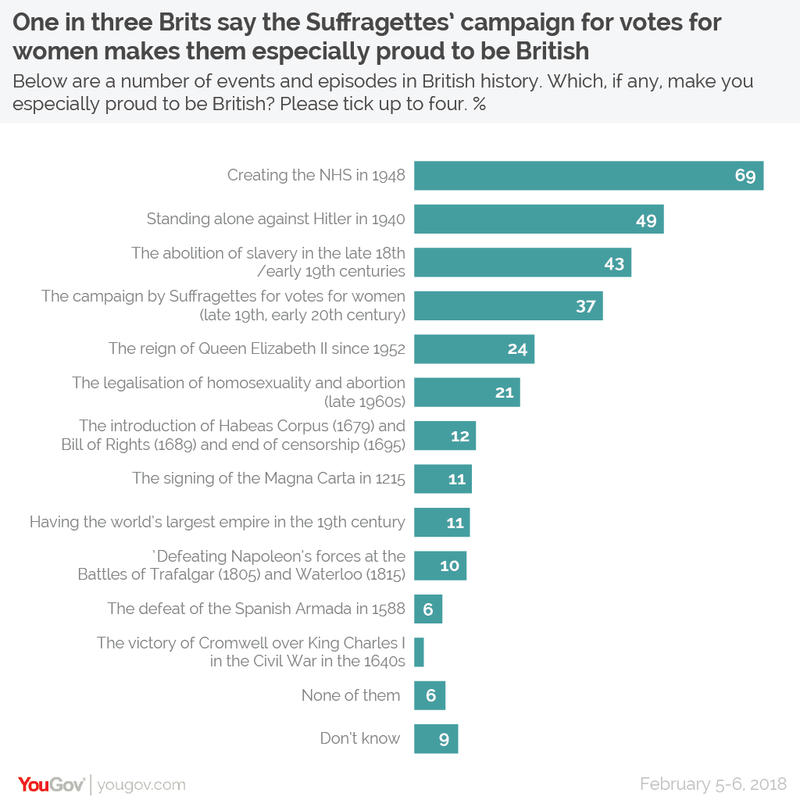 New YouGov research reveals that the Suffragettes’ campaign for voting rights makes 37% of people proud to be British, putting it fourth from the list of 12 events in British history, behind the creation of the NHS (69%), defeating Hitler (49%) and the abolition of slavery (43%). Unsurprisingly, women are more than twice as likely as men to select this (50% vs 24%), making it the second most popular event overall amongst females. Those aged 60+ are also more likely to choose this event. 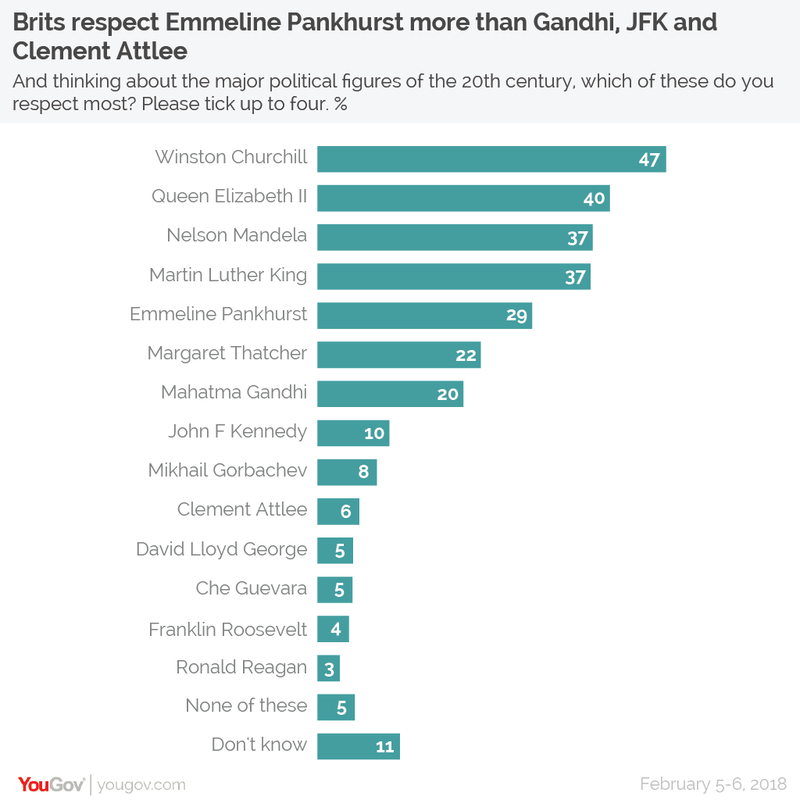 Around three in ten Brits (29%) chose Emmeline Pankhurst as one of their most respected 20th century political figures, slightly more than Margaret Thatcher (22%) but falling behind Queen Elizabeth (40%). Again women are more than twice as likely as men to select Pankhurst (39% vs 18%). 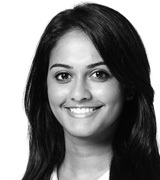 Feminism is still needed in Britain, but where are the feminists? The campaign for equal voting rights ultimately did not achieve its objective until 1928, when the voting age for women was lowered from 30 to 21 to match the age for men. But full gender equality remains illusive, and this is recognised by the half of Brits (49%) who say there is still a need for feminism in Britain today. This is in spite of the fact that the majority of Brits (57%) don’t consider themselves to be a feminist. Only a third of British women (34%) and one in five British men (18%) say they consider themselves to be feminists. YouGov US discovered similar rates of women and men identifying as feminists back in 2016. With greater focus on tackling pay and harassment across sectors, 2018 can be viewed as a turning point for encouraging debate surrounding the role of women in society. In addition to the centenary for when women were allowed to stand for Parliament (21st November) and vote in a general election for the first time (14th December), 2018 is likely to continue being a watershed year.